"I had to do something. A young man came into my home for protection. Is he dangerous? No. Is he a spy? No. Is he a traitor? No. He's just a Jewish teenager who wants to leave." Tour for Humanity Heads to Eastern Ontario! 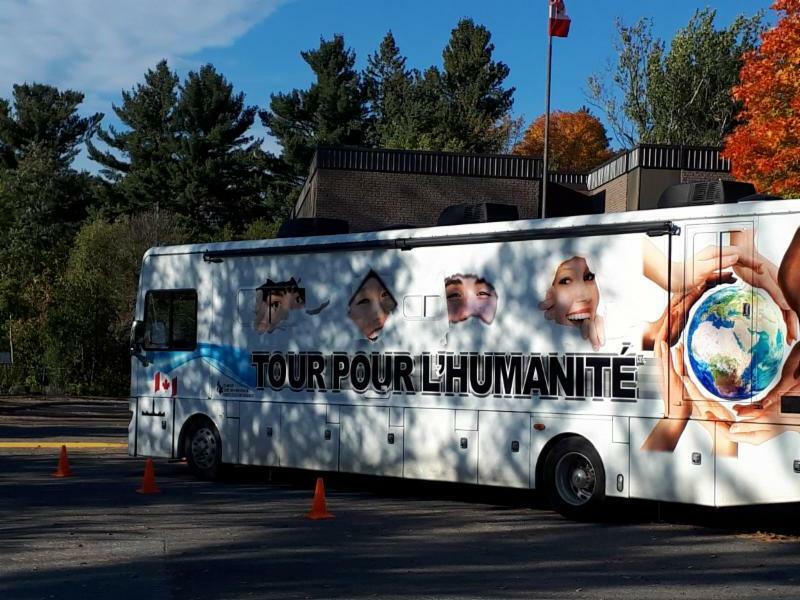 The Tour for Humanity started its week-long journey through Eastern Ontario last week, making its first stop in Gloucester before heading to Brockville, Chesterville, Cornwall and finally to Montreal! Our educator Elena received a warm welcome at a Middle School in Gloucester on Thursday as she arrived to deliver 11 workshops over two days, focusing on topics such as the Holocaust, Jewish history and identity, Canada's role in the war and residential schools. 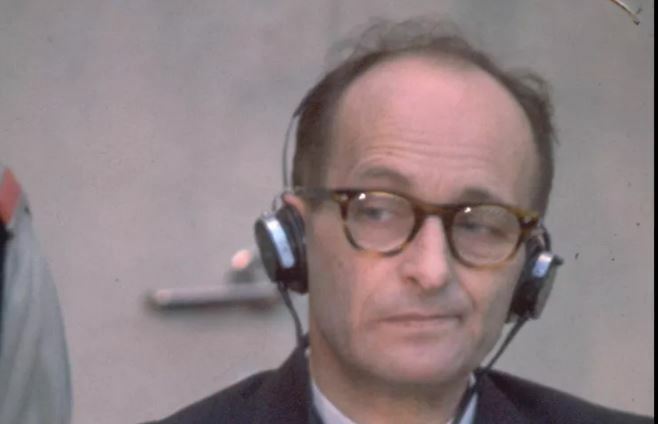 In a documentary released Tuesday, excerpts from tens of thousands of documents about World War II shed light on Nazi influence on Argentina and the Nazi war criminals who lived there after receiving help from the country. 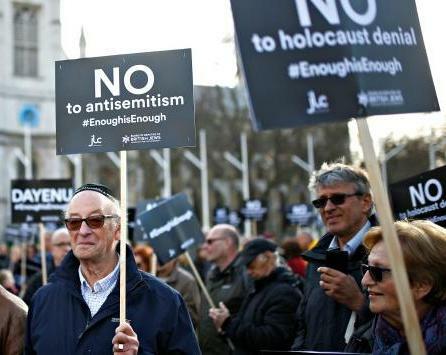 The documents reveal communications between Argentina and countries involved in WWII, information sent by the Argentine Embassy in Germany, and records related to the blacklist of Jews. 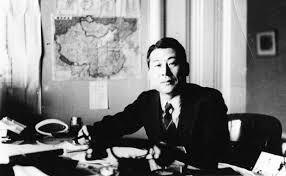 Sent to run the Japanese consulate in Lithuania in 1939, Chiune Sugihara went on to save thousands of Jews during the Holocaust by issuing visas. Defying his government, Sugihara helped Jewish families travel through Japan to other countries, calling his work a "matter of humanity." It has been estimated that over 40,000 people are alive today because of this one man. 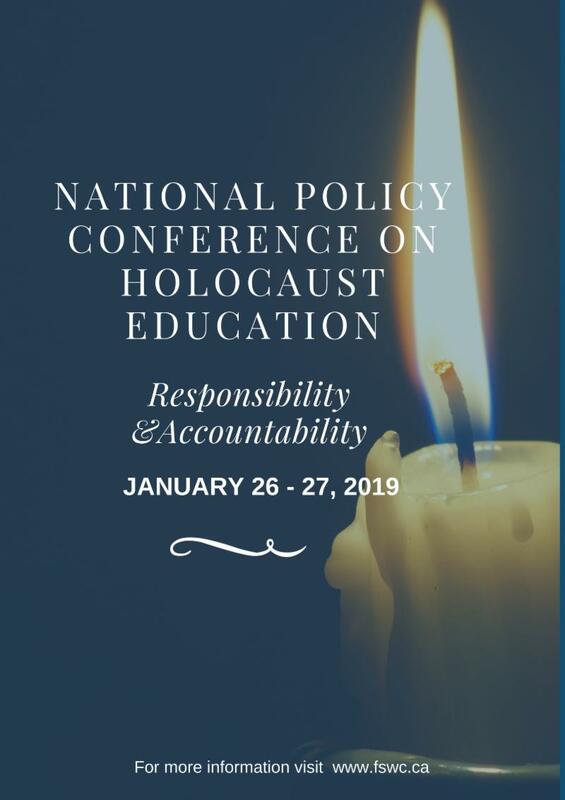 Each year, Friends of Simon Wiesenthal Center hosts its annual National Policy Conference on Holocaust Education, welcoming educators from across the country for impactful conversations led by leading Holocaust and human rights educators and experts. This year's conference will include a panel discussion on best practices in Holocaust education as well as a multi-generational panel featuring a Holocaust survivor, child of a survivor, and grandchild of a survivor to discuss the long-term impact of the Holocaust. For more information about the conference or to register, click here. Support FSWC's numerous programs that bring Holocaust and human rights education to both students and professionals, helping make the world a better place every day. The French government has suspended its insistence on special labeling for West Bank products following a lawsuit alleging the practice is discriminatory. According to a statement from the Lawfare Project, which launched the lawsuit, French authorities announced the suspension of the labeling requirement imposed on Israeli products, pending a decision by the European Court of Justice. The requirement mandated that products from the West Bank and Golan Heights be labeled with the designation "Israeli colonies." Ten Jewish-American baseball players have received Israeli citizenship, gaining the opportunity to represent Israel at the 2020 Olympics in Tokyo. 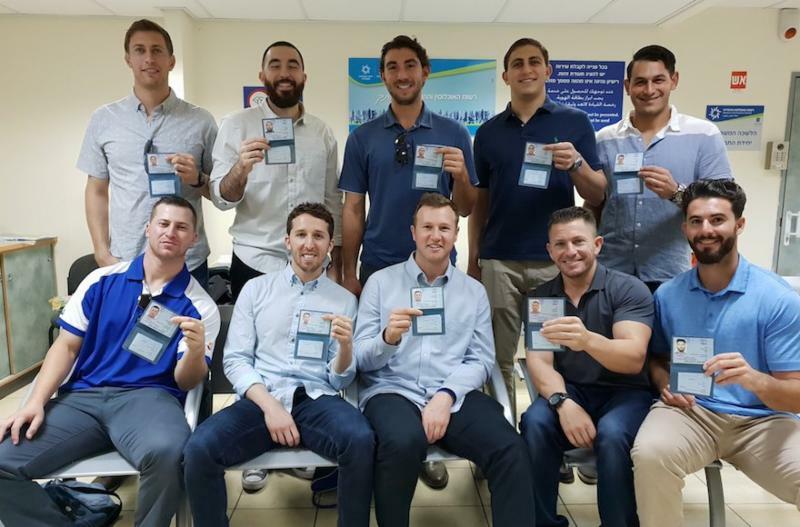 The players, some of whom represented Israel in last year's World Baseball Classic, applied for and received citizenship together. Jordan has decided not to renew parts of its 1994 peace treaty with Israel. On Sunday, Jordan's King Abdullah announced that two of the treaty's annexes - which allowed Israel to lease two border areas, Baqura and Ghamr, from the Jordanians - will not be renewed. This decision comes after protesters called on the king to cancel the lease and reclaim sovereignty over the territories. 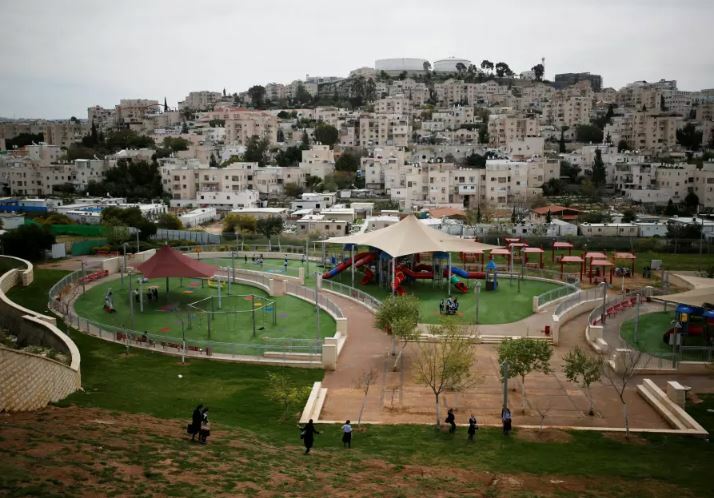 Israeli Prime Minister Benjamin Netanyahu said that Israel intends to negotiate with Jordan over extending the lease. State of the Union Is Two Weeks Away! On November 5, Friends of Simon Wiesenthal Center will be hosting the annual State of the Union dinner and presentation, welcoming an incredible lineup of speakers. 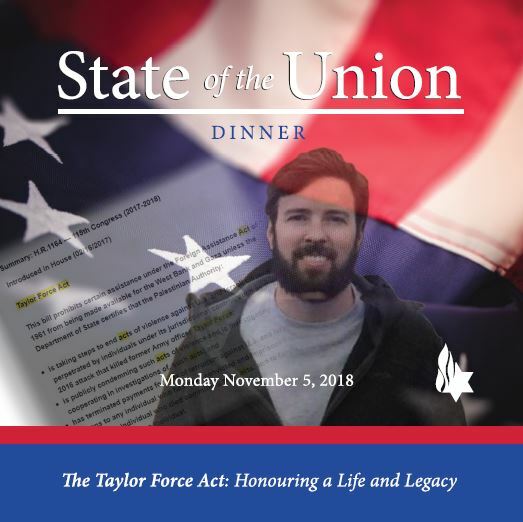 Join us as we honour the parents of Taylor Force - an American who was killed by a Palestinian terrorist during a trip to Israel. Robbi and Stuart Force refused to do nothing following their son's death, instead choosing to spearhead the Taylor Force Act - which was passed this past March, ending American aid to the Palestinian Authority until it ceases payments to terrorist and their families. To register, contact us at tsteyn@fswc.ca or 416-864-9735 x 21. If you would like to report antisemitism or news of concern to Friends of Simon Wiesenthal Center, please email aborisovsky@fswc.ca.